* Our breathtaking pave Cubic Zirconia wedding or gala earrings boast a dramatic 2 3/4" h x 1/2" w linear design with unique geometric elements. 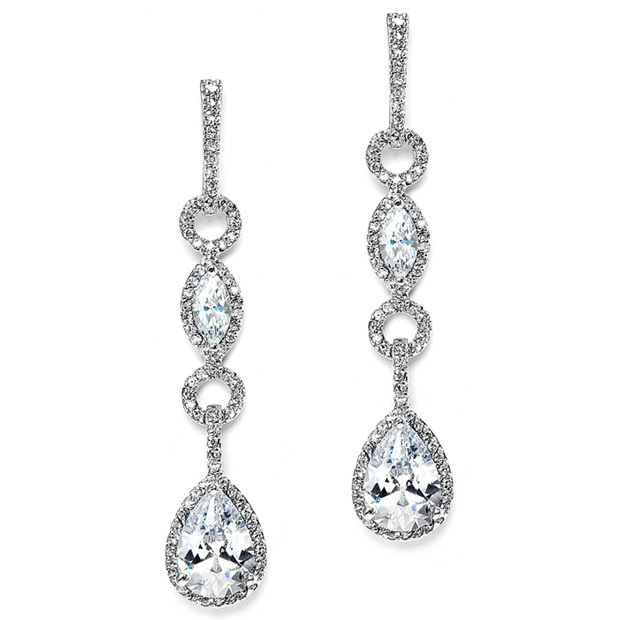 * Our rhodium plated dangle earrings have bold CZ pears & marquise perfect for bridals, pageants or society galas. * Mariell's ravishing pave Cubic Zirconia wedding or gala earrings feature a dramatic linear design with one-of-a-kind geometric elements. * Fiery sparkle dances off their bold teardrop and marquise stones. * These silver rhodium dangle earrings are a breathtaking wholesale accessory for bridals, beauty pageants or society galas.